We're baaaack! In Bloomington, that is. After 3 years in Florida, we decided to head back to the Midwest. I know, I know. Why would anyone leave the sunny weather and lakeside living? I get asked this question a lot; our answer isn't that clean cut as "for a job" or "to raise a family". The truth is, we missed the people. We missed our families. We missed that Midwestern hospitality that everyone hears about (and until you leave, you don't realize how unique and special it is!). We enjoyed playing on the lake day in and day out, but it just didn't seem like our "forever home". With lots of prayer from family and friends, we decided to come home. Since we've moved back, Dylan has started working at his family's business, Wick's Pies, a 70 year old company that makes more than 1900 pies an hour. More on that, later! I've continued to work with my clients remotely in Florida (YAY! ), and we've been able to settle in to Bloomington with our one year old cavapoo, Penny. I guess what I'm telling you is God is good. But seriously, His plan for us to be in Indiana was SO much better than we thought! We've been able to spend time with our families, attend weddings, graduations, and bbq's that we would have missed if were in in Florida. We've enjoyed watching the seasons change. We were able to reconnect with old friends and meet new ones. Speaking of new friends... I recently met my friend Allison on a couples retreat in Hawaii (nothing like the movie, I promise). She is an amazing macrame artist, as well as a super sweet, Christ-centered woman with a passion for simple, local living. I had the opportunity to work with Allison on updating her logo and branding, and I was inspired by her simple-living concept. Working by hand, Allison creates every piece to-order – no two pieces are alike. This is the true essence of hand-crafted, after all! 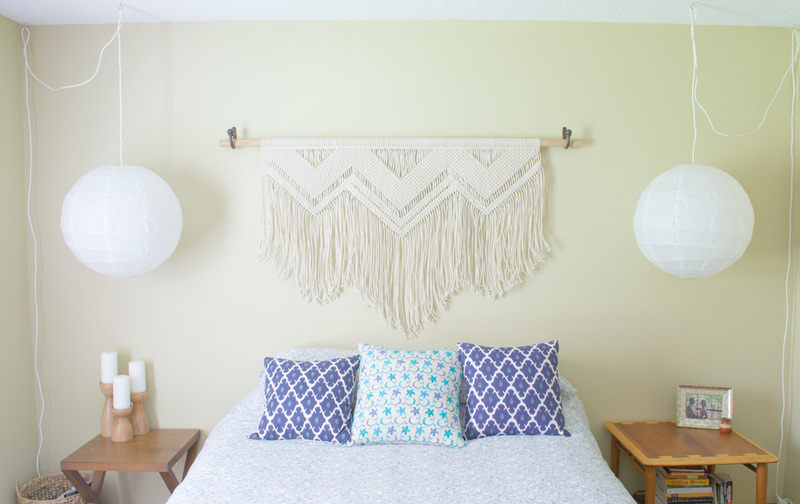 I also have a custom-made macrame headboard thanks to her! We absolutely LOVE it! It is something we will treasure for years to come, and we can't thank Allison enough!